We had a lovely weeks stay at Fourteen The Square Gerrans. The cottage was in a good location for exploring other parts of Cornwall and was a 5 minute walk into Portscatho where there is an excellent dog friendly pub. The cottage was spotless and very well maintained. The enclosed garden and private parking space made all the difference. We would recommend the area and cottage to our friends. Charming cottage, very clean and comfortable. Lovely Christmas decorations and welcome pack. Property had not been let for a while so bedding and sofas damp, only one heater on full, took some time to get cottage warmed up and dry! Reply from Owner Thank you for taking the time to write a review, we are delighted to hear that you enjoyed your stay over Christmas. We were however surprised by your final comments as we were staying at the cottage two weeks before your stay and have been back over the New Year. We have a full central heating system and can only assume that the heating was not adjusted correctly before your arrival, for which we duly apologise. We do, however, disagree with your choice of wording and whilst we accept the fact that the furnishings could of felt cold, they would definitely not have been damp. 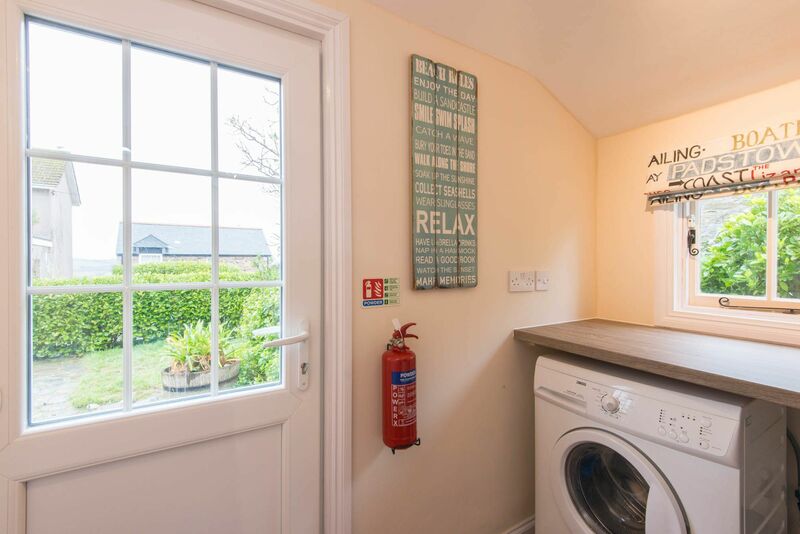 We have a 24/7 housekeeping service which we urge guests to use if any problems arise as our aim is to provide our guests with an enjoyable stay in our cottage. Compact but comfortable cottage with everything you need. We like the location up the hill as it provides a brisk walk! Stayed for a week as a base to explore Cornwall. 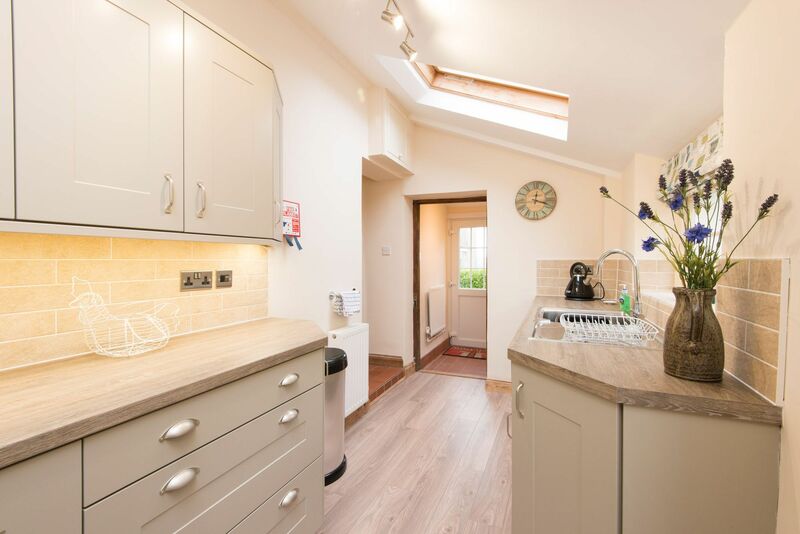 Lovely traditional cottage but with fantastic new kitchen and shower. The garden was pretty to sit in with a view over the hills. Perfect for al fresco eating on sunny days. Front views straight onto amazing church which chimed reassuringly on the hour. Beware of parking out front as we got a ticket. Local pubs serve good beer and food. We loved taking King Harry ferry to Falmouth and beyond. Minack Theatre, Land's End and Lizard are all a must - a fair drive but achievable. We had a great week in this cottage which although compact has everything we needed! It was spotless when we arrived and in a lovely spot within walking distance of the harbour. So many fantastic beaches within a short drive. The caretakers were so friendly and helpful. Be aware of the tight drive into the car parking space. We were happy with everything and had a lovely time if I had a comment It was that the water was only hot enough for a shower. Cottage is fabulous , great location , immaculate and very comfortable . Would definitely recommend ! The lane at the side of the house is very narrow , be aware ! Lovely cottage, very well equiped, good quality furnishing. Great kitchen. The cottage is listed as dog friendly, but wiith the limits the owners list on arrival, I feel friendly is rather overstated, tollerant maybe a little closer to the truth. Dogs not allowed on furniture, not allowed upstairs and not allowed to use the garden as toilet, though obviously it had been, going by the bare patches on the grass!! Dogs not being allowed upstairs was very inconvenient as our little one always sleeps by my bed therefore we had very broken nights !! Had we known these restrictions we would not have booked this cottage! In my opinion the owners should make all restrictions clear on the cottage information. Also the gate needs renovation as it does not keep the garden completely secure as promised. I would however recommend this cottage to others even though we probably wouldn't book again ourselves. It is a lovely property for the right people and we did have a good holiday. Reply from owner Thank you for your comments we are glad you had a good holiday and would recommend our cottage to others. We must however point out that Cornwalls Cottages terms and conditions clearly state that pets are to be 'kept under control and exercised off the premises. Pets are not permitted in the bedrooms or on the furniture' we therefore do not feel it necessary to repeat the 'restrictions' on our cottage information page as it applies to ALL dog friendly cottages. We will get the gate problem fixed thank you for bringing it to our attention. An excellent property, peaceful, lovely garden, right in middle of all your needs. Owner obviously takes pride in it. Interested in how he builds extension especially if there's a bathroom upstairs. Will visit again if price is right. Portscatho is one of our favourite haunts over 60 years! One of the best properties for sure. 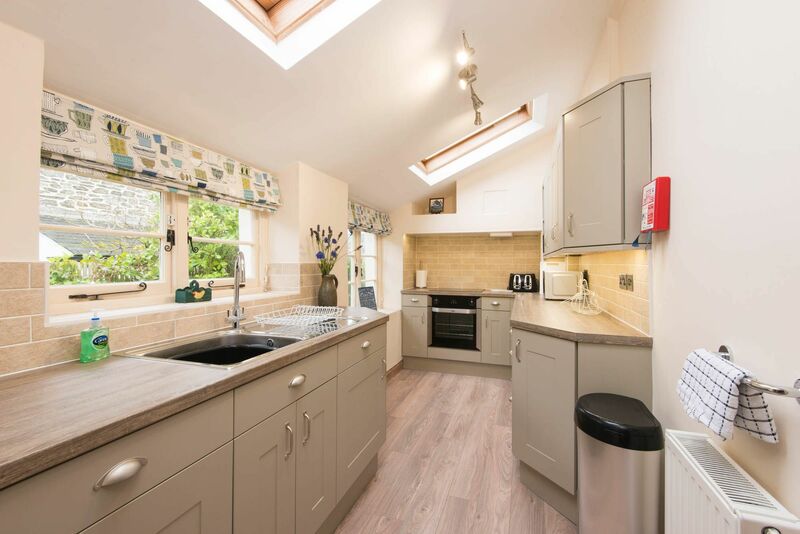 A pretty and very well equipped cottage with a lovely modern kitchen and bathroom. There is a well kept back garden for outdoor eating. The only slight negative is the stairs are steep with no rail at the top. Thanks for a great holiday. We are regular users of self catering accommodation in Cornwall and the Roseland Peninsular. We knew the area of Gerrans and were not dissapointed with our stay at 14 The Square. The cottage is very pleasant and has everything you need. There was a welcome pint of milk in the fridge on our arrival. Local facilities are ample and the fish and chips from the van by the car park in Portscatho on a Friday and Saturday night are to die for. Easily reached on foot is the Hidden Hut. WE didn't get to use it this time but have in the past. Pub just across the road. Safe parking around the back of the cottage. Plenty of local information supplied in the cottage. Secure garden for your dog unless you have a small dog like us, then we used the recycle bin to block the access to the front gate with no problems. Would recommend the cottage to others. We had a lovely stay in this cottage. It was spotlessly clean and very well equipped. We will definitely be returning as soon as we can. Lovely stay in a fantastic location. Lots of good long walks, excellent beaches and gardens, plenty of dog friendly places, good food, especially the Hidden Hut. Cottage over all very good - let down only by 2 small things - only 3 sets of towels for 4 guests (we used our beach towels), and no black bin bags. We tried to get in touch with the telephone no provided but was an answer machine which did in fairness give an alternative number to use in an emergency - however we did not class the 2 small problems mentioned as an emergency, and just wanted to get on with our holiday. Would definitely book again. Reply from Owner Thank you for your comments. We are glad you enjoyed your stay in our cottage on the Roseland Peninsular. We are sorry to hear about the lack of towels and black bin bags during your stay and can only apologise. We would encourage all guests to leave a message on our housekeepers contact number with any concerns no matter how small. We had a wonderful stay at 14 The Square, with our two sons and two dogs. 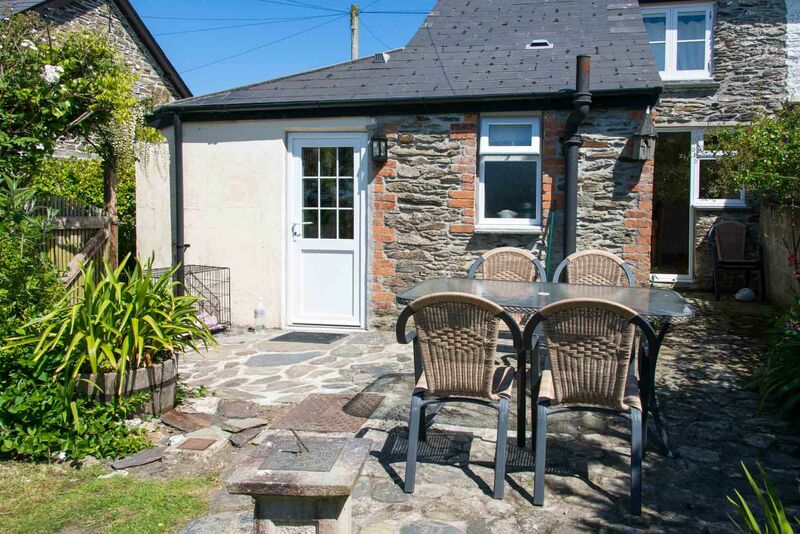 Perfect set up, well appointed cottage so close to the beach and metres from the pub. We would love to come back! We had a lovely stay and have recommended it to others. Great cosy cottage with all the comforts of home. Fantastic location walks and walks to keep the dog happy. Two pubs a couple of shops. The gem that is the hidden hut is close to ensure a great lunch is always available on the beach. 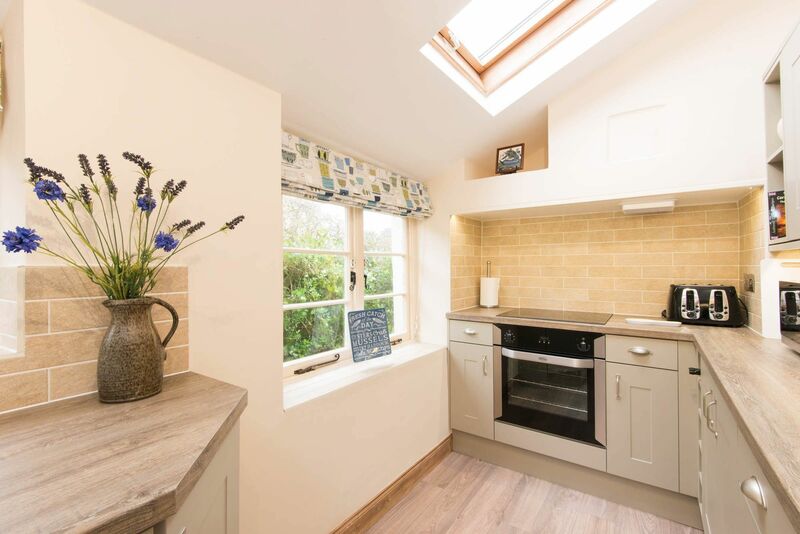 Although this lovely cottage is positioned just a couple of minutes walk from the beautiful Portscatho it actually feels like an advantage given that it is still so close to the facilities and views of the village whilst also benefiting from the ease and friendliness of Gerrans. (Easy parking, lovely pub with garden that welcomes you and your dog). The cottage was very clean and comfortable with all the facilities we needed - it felt like a home from home. We were lucky to have great weather which meant that we could sit in the garden for breakfast and enjoy the view of rolling hills. Porthcurnick beach is easily walkable as are all the facilities of Porthscatho, pub, restaurant, shops, galleries, coffee shop, costal path and the magnificent Hidden Hut. This cottage offers a great base for you to easily access a truly exceptional part of Cornwall. We had a wonderful and relaxing holiday. 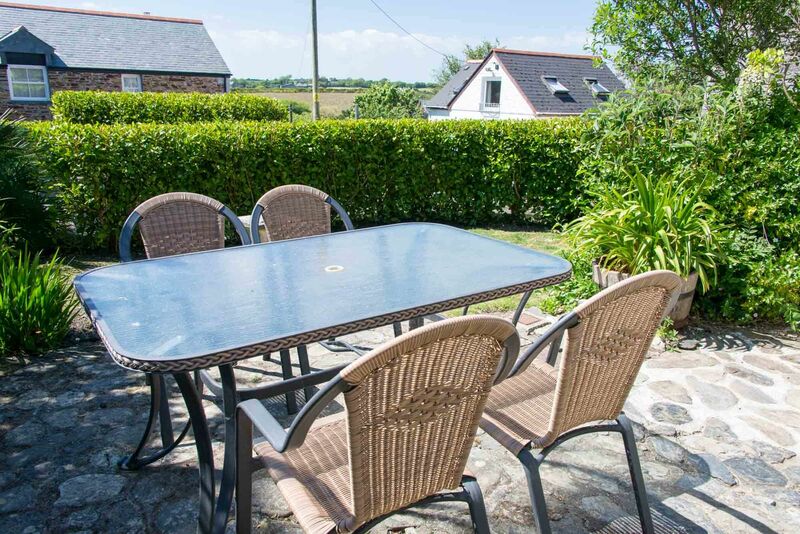 Beautiful location just a short stroll from the habour and beaches. The lane to the parking is a little narrow but was manageable, the pub opposite served good food and is dog friendly. The hidden hut a stroll along the costal path is well worth the walk even if it did seem to rain every time we turned up. Lovely cottage and garden in a beautiful place, with very nice people in the local shop and pubs etc. Plenty of very nice walks and beaches, really enjoyed our stay. We have stayed here before, but this time there was the added bonus of a refitted kitchen and bathroom. Shower was excellent. We had our dog with us, so we stuck to the local beaches - Towan is our favourite and sometimes we had it to ourselves! The cottage is warm, comfortable, very clean and well equipped. The car parking space is a good size, but it is a tight squeeze getting a Mondeo down the side lane to it. Had a short break with hubby n dogs. Accomodation was very well equipped, couldn't fault it. location fantastic. Fortunate to have lovely weather too. This property was basic and lacked enchantment especially as the weather meant we had to spend some time indoors. The kitchen newly refurbished was the best area. Bathroom small and we suddendly found ourselves out of loo paper an extra role would have been helpful. Likewise no kitchen utensils to clean pans. So an immediate shop for these and coal an essential. We had thought we were going to a fishing village but area quite desolate. Beaches and coastall walks the saving grace and the pub. Will we visit again No. Fourteen the Square is a lovely little cottage in the village of Gerrans. The property was spotless and very comfortable. The situation is excellent with a shop nearby and The Royal Standard pub just over the road. The pub is very nice with no piped music, nice food, real ale, is dog friendly and has a wonderful beer garden. Although on the main road there is very little traffic as the road only leads to a dead end at St. Anthony Head. Porthcurnick beach and The Hidden Hut are within easy walking distance. Other visitors have mentioned the narrow lane at the side of the cottage that leads to the parking space at the rear. While we had no problems with our VW Polo owners of large cars and 4x4 type vehicles could have problems but there is free parking not far away behind the Royal Standard and many of the locals seem to use this facility. On the whole an excellent holiday cottage and one that I would recommend. We had a lovely holiday in this stunning part of Cornwall. Fourteen the square was clean and comfortable and had everything we needed. We also had some lovely meals at pub at the bottom of the hill and everyone where so friendly and if you are very lucky the sun might shine. A lovely cottage, well appointed, very comfortable and only a few minutes walk down the hill from Portscatho. The patio garden is virtually west facing which is a real plus. All in all, we thoroughly enjoyed our stay there. The only negative is the narrowness of Well Lane which leads to the car parking space to the rest of the property. We have an Evoke and it was very very tight. However there is a free car park just down the lane to the side of the Royal Standard which is within walking distance. COMFORTABLE + HOMELY. A GOOD BASE FOR GETTING AROUND. FRIENDLY VILLAGE, A MOST RETURN. GREAT BEACHES CLOSE BY + CLEAN. ONLY DOWN SIDE BATHROOM DOWNSTAIRS. Lovely cottage in good location with parking. Nearest pub 30 metres. A quarter mile walk down a steep hill to Portscatho which is fine going down but takes a little effort coming back! The cottage is recently refurbished with new bathroom, kitchen and most furniture and utensils and contained everything we needed. Only two very small niggles - there is no bathroom upstairs and the two sofas are both uncomfortable (but new). We arrived at the cottage and were extremely pleased with the accommodation. Everything was spotlessly clean and the welcome pack of biscuits, teabags sugar etc was very much appreciated. The cottage is beautifully decorated and well equipped. The kitchen was like brand new as were the appliances, utensils etc. 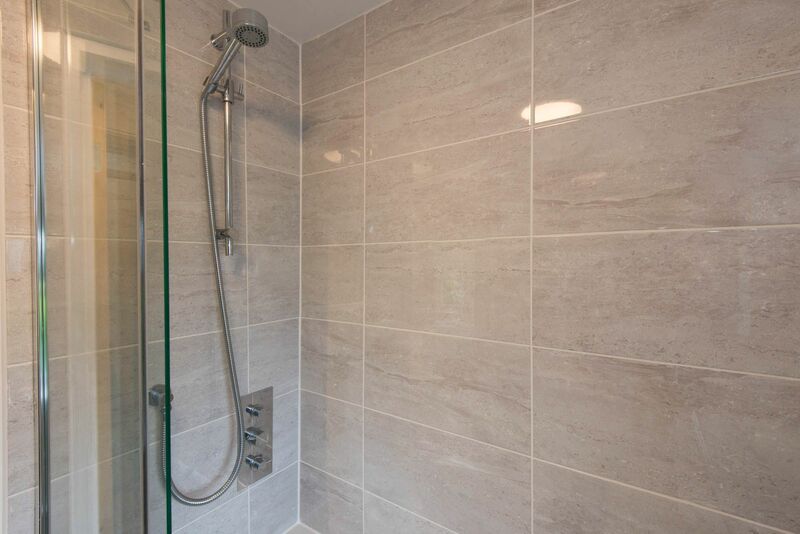 Although small the ground floor bathroom again is beautifully fitted out and has everything you need including a great powerful shower. Location is spot on too. 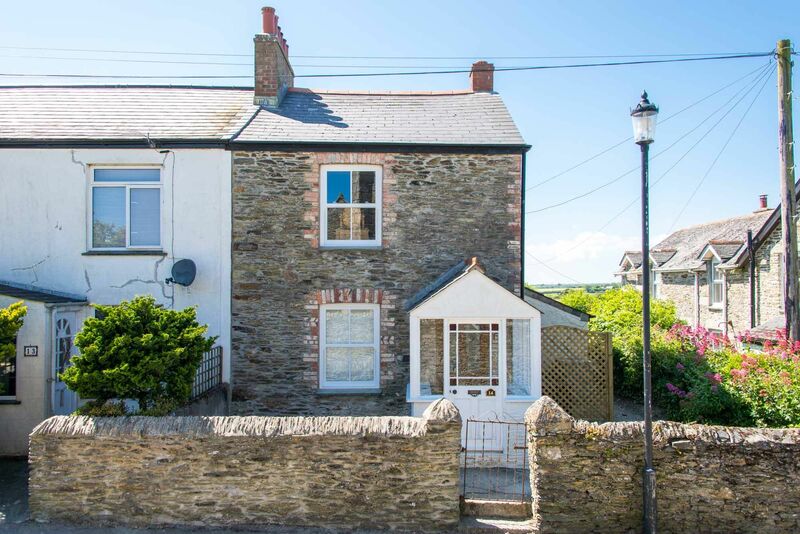 Situated in the centre of the village opposite the church with only a 5 minute walk into Porthscatho where you can pick up the coast path to several beaches on foot. We ate several times in the Plume Of Feathers and found the food here very good. Also you could buy anything you wanted from Ralphs general store which was very well stocked. We had read in previous reviews that access to the parking space at the rear of the property was very tight. We have an Audi A6 Estate and didn't have any problems getting in and out of the space and liked the peace of mind of being able to park the car off the road. We would highly recommend the property and we will definitely stay here again. Good morning, We stayed at 14, The Square again this year and noticed some improvements versus last year. 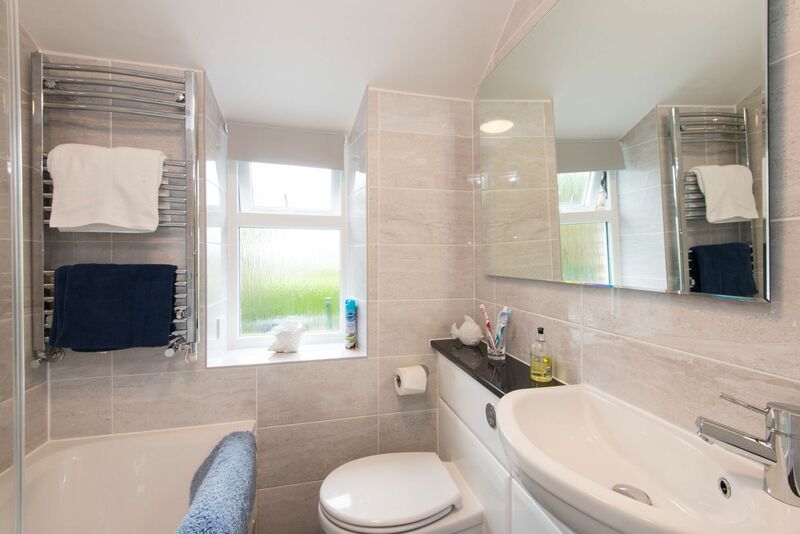 Notably the kitchen and bathroom had been refurbished. The cottage is very good throughout and the location is great. Hard to suggest any improvements really. The dining room table top needs a coat of varnish, seal or wax as it is effectively bare wood and stains easily. Everything is very good. Lounge - good. A good choice of books etc. Dining room good. Heating very good. Bedrooms great. Bathroom and kitchen good and it is very useful having a washing machine. A delightful cottage, decorated to a very high standard. Although the cottage has a modern kitchen and bathroom they do not destroy the quaint feel of cottage. Ideally located within a short distance from the sea, pubs and shop. With spectacular coastal walks on the doorstep, this is an ideal location for dog owners. I would highly recommend staying here. This cottage is in a perfect position in Portscatho for the beautiful village and beach at the end of the road. The two pubs serve good food and welcome dogs in both. The community is very friendly as you will encounter when you visit the shop, don't be in a hurry as everyone has a chat at the till point, which is lovely, you're on holiday !! We really fell in love with this area and would most certainly visit again. The cottage is clean ( bedding, towels , bathroom and kitchen surfaces) and comfortable and I loved the seaside theme running through the cottage. However, you don't have to look far to find the cleaners could have done better. There was still ash around the hearth in the fireplace, there where white dog hairs on the rug and under the dining table. 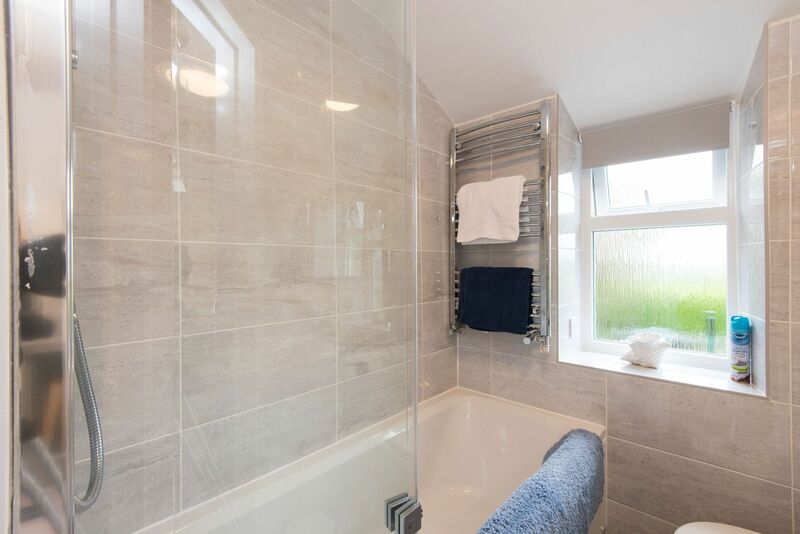 The bathroom desperately needs updating as I have read the owners are going to do during the winter but they should also look at the kitchen which although ok would look so much better if all the unsightly bits where finished off properly I.e. Under the sink, at the side of the cooker and the skirting boards. Also the garden was overgrow and the outside table dirty and covered in dying flowers . There is so much potential here it could be 5 star with a bit of attention. I think this is the problem when owners do not live in the area to keep an eye on things. Reply from Cornwalls Cottages Ltd Fourteen the Square has now undergone a complete refurbishment under new Ownership over the winter of 2015. The kitchen and bathroom have been entirely refitted and look stunning - please check the photos! The rest of the property has been completely freshened up and new local housekeepers have taken over. We enjoyed the location and the fact you could walk to the beach and we hardly drove further than a couple of miles throughout our stay. There were also a lot of other great beaches nearby. We felt that for what we paid you got less for your money than in many other parts of the country, but I guess that's just the market as Cornwall is so popular. Getting into the parking spot was a very tight squeeze! And the carpet grips on the stairs stick through the carpet and spike your toes if you are not careful - they could do with a gentle tap with a hammer. But these are small points and we had a fantastic week. I didn't know how to rate 'service during your stay' as we did not require any! Reply from Cornwalls Cottages Fourteen the Square has now undergone a complete refurbishment under new Ownership over the winter of 2015. The kitchen and bathroom have been entirely refitted and look stunning - please check the photos! The rest of the property has been completely freshened up and new local housekeepers have taken over. The weather made this a highly memorable holiday and we didn't leave the Roseland much for that reason. The location was just fantastic; woods, creeks, fields, coast and amenities to boot! A beautiful cottage in a beautiful location. Really enjoyed our stay - it was everything we hoped for, quiet and refreshing with local shop and pubs. We had a lovely holiday in this delightful little cottage. Having read some negative reviews we were not sure what to expect and although the cottage was in need of some TLC it was ideal for our week in Cornwall. Very clean and everything you might need was provided. We had some problems with the fridge, and a word of advice - bring your own saucepans etc because although provided theirs had seen better days. Everything else was fine, the beds were really comfortable and the living room was very cozy. The cottage was warm and the little garden was a bonus. The little lane which led down to the parking bay was very narrow and although we managed it would be very difficult to get a people carrier or a 4 x 4 down there. The location was perfect and very quiet, while still within easy walking distance of Portscatho and easy driving distance to St Mawes which we particularly liked and from where you can take numerous boat trips to Falmouth, Truro etc. We have stayed in Portscatho or Gerrans over the past 10 years and have always had wonderful holidays. 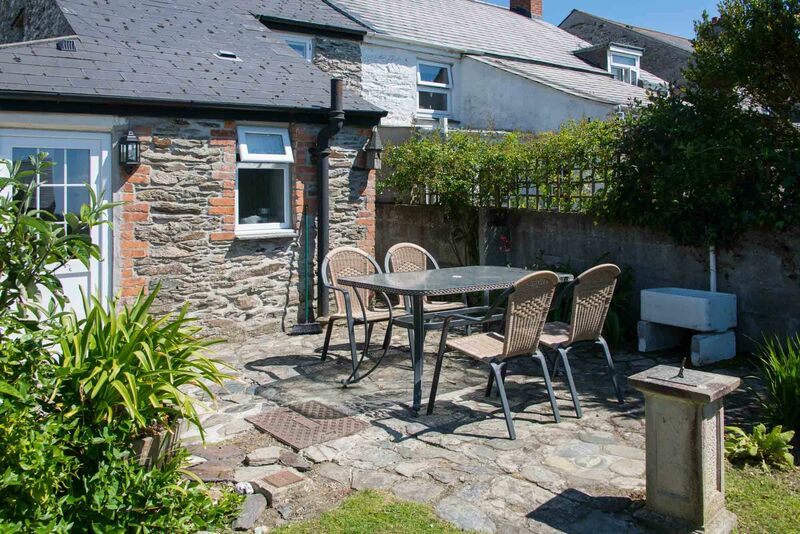 14 The Square was a lovely cottage, ideally located and with a charming garden. It was quiet and peaceful. The house is tastefully and well equipped and was in excellent condition upon arrival. It was very clean with linen provided. We would most definitely recommend it to others. Nice cottage in good location with own parking. However bathroom is real need of help, generally very very tired looking and smells damp. Kitchen tiled surfaces need attention & re-grouting. Had a lovely week but above would mean would not return to this property. 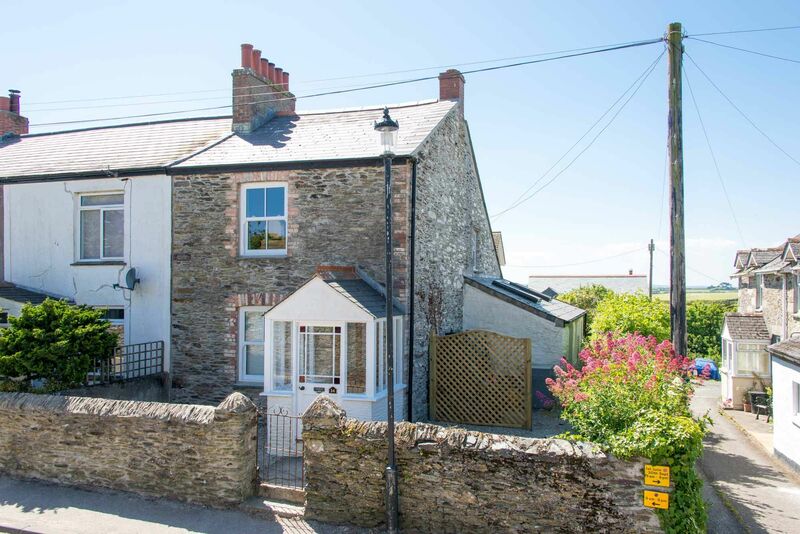 Pretty character holiday cottage in an excellent location - about a 5 minute walk away from Portscatho. Very quiet, warm (really effective heating) and clean with lots of things provided. 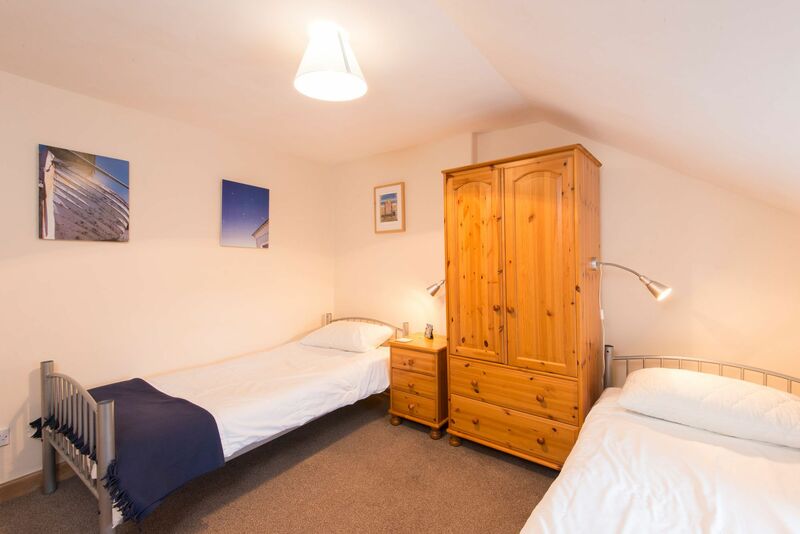 The main double bedroom is spacious with a large wardrobe and a good sized bed (I presume King sized). The bed is comfy and we slept well, but, just to be really picky, I would have preferred a feather/down duvet and pillows to the bog standard polyester ones provided. This is a minor point though as there was nothing wrong with the ones provided. 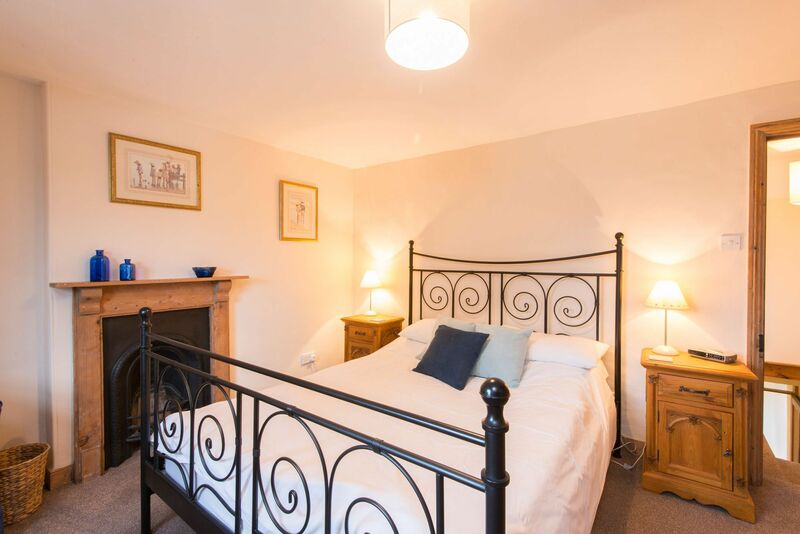 Although we didn't use the second bedroom, it was spacious with two single beds - ideal for two children. The kitchen is a good size and well equipped, although don't expect top quality equipment. Everything was pretty basic and a few of the pans weren't in great order, so if you're going to be doing lots of cooking you might want to bring a couple of your own from home, particularly a good frying pan. The cooker was great with plenty of rings and two oven compartments. Another thing to bring is logs (if you'd like to use the woodburner) as there was only one left when we arrived. However, this didn't bother us too much as we were really impressed with how warm and cosy the house was. There is also a great little drying area next to the bathroom which we found really useful for drying things quickly. The bathroom was fairly small and basic, but it did the job - there was a decent shower over the bath and everything was in good working order. 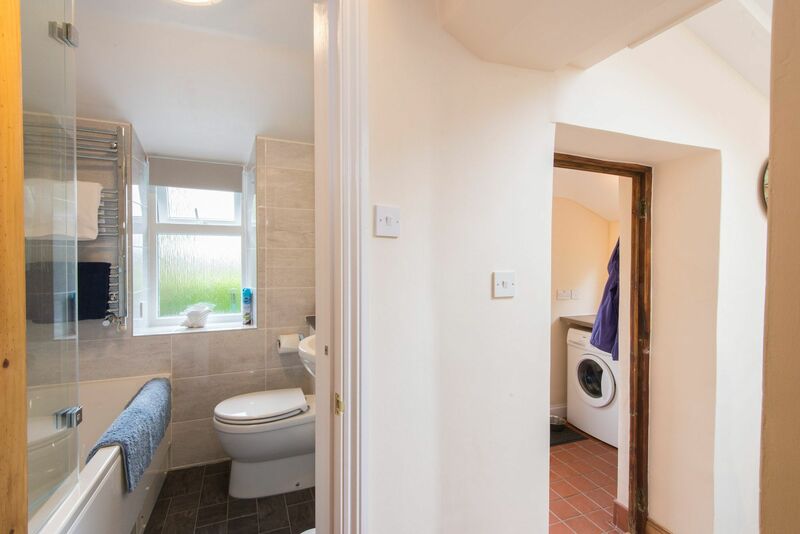 It's worth bearing in mind that this is a character property so a smallish bathroom is the price you pay for a pretty cottage! I wouldn't call this a luxury cottage, but then I don't think this is what it is trying to be; it's essentially a family holiday cottage and it fulfills this purpose well. Everything is very clean and simply presented. Having read a couple of negative reviews about the cottage being a bit shabby, I didn't have super high expectations, but I was really pleased to see that all of these comments had been taken into account and there was new carpet and a new TV, showing that guests' comments has been taken into account. In summary, I would definitely recommend this cottage for both families and couples. The property was very poor bathroom smelt of damp. We felt the property needs some work done on it to bring it into the standard it needs for what you are paying have stayed in a lot of holiday properties that were of a very good standard that cost less. Would not recomend this property. The Cottage is in need of re-furbishment. The stairs and upstairs carpet is threadbare and badly stained, beds are of very basic comfort. The TV quality was poor. We do a great deal of Holiday Cottage Holidays and this was not too the standard expected. Reply from CornwallsCottages.co.uk on behalf of the Owner Thank-you for your constructive comments we have now updated to a new flat screen TV, as for the narrow stairs the cottage is over 100 â?? 150 years old and you will not find modern stairs fitted in a property of this age. Regarding the church clock we unable to stop the striking of the bell. We had a lovely stay at 14 The Square in the middle of August. Very clean and comfortable. Everything provided which you could need in a holiday cottage. Small garden but big enough to sit out to eat when it was sunny. Not much grass so no good for children to play really. Lovely village and great beaches nearby. We loved the area and look forward to returning. The week we had was great and the weather very kind to us. We especially liked the west facing garden that allowed us to enjoy the evening sun and the open fire later in the evening. Portscatho was beautiful and the two pubs and beach within walking distance was a real plus also. We had an absolutely lovely time at Fourteen The Square, and can imagine going back there again. There's too much to see in Cornwall in one week. It was very comfortable and had great facilities and a great location. It's a really lovely and charming place to spend the week and you were brilliant to deal with. We had a lovely week thank you, the cottage was delightful. We all had a lovely time and the cottage was perfect. We’ve earmarked it as a place to come back to in the future, especially as the area was so quiet and non-touristy! The pubs were great and local shops really well stocked. Parking was no trouble and the neighbours were friendly. All-in-all, a very nice holiday! Floor plans will appear here shortly. Positioned on The Square in Gerrans, Fourteen is a charming semi-detached stone cottage which is full of character and offers a delightful place to stay for either a couple or small family. Gerrans lies immediately to the west of Portscatho so it is only a short five minute walk down the hill to the pretty little harbour where many artists have taken inspiration due to the superb light. There are a great selection of sandy beaches to choose from, either within a short walk or drive along the coast. The famous Hidden Hut is just a 15 minute walk away. This is a peaceful and serene part of Cornwall to explore with some great walks to be had right from the cottage. Fourteen itself is a really cosy cottage with a separate lounge and dining room, both with beamed ceilings and an open fire & wood burning stove. The cottage is particularly warm place to stay as it has oil-fired central heating too. The kitchen is well fitted with a new electric oven and hob. 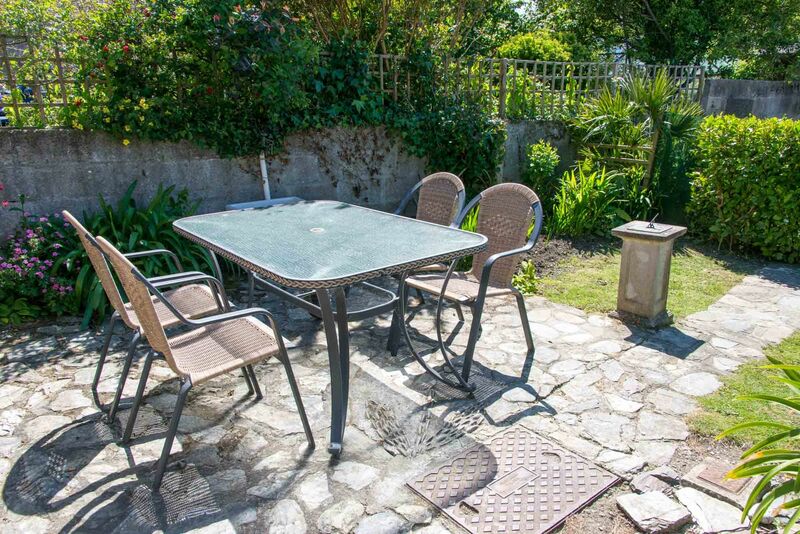 There is also a private back garden, perfect for alfresco dining and sunset watching. Ground Floor: Lounge with open fireplace and two comfortable sofas. Dining room with coal burning stove. 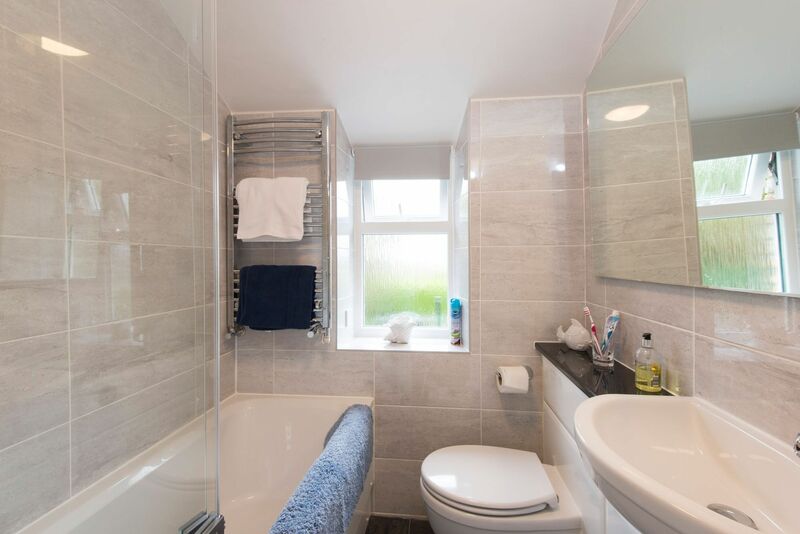 Small family bathroom with over bath shower & WC. Kitchen and Utility room. First Floor: Master 5ft double bedroom with king size bed. Twin room with 3ft beds (newly refurbished not as pictured). Exterior: Private rear garden with patio area & external furniture with views over rolling countryside. Heating is via oil fired central heating, open fire and stove (both use smokeless coal only which is not supplied). 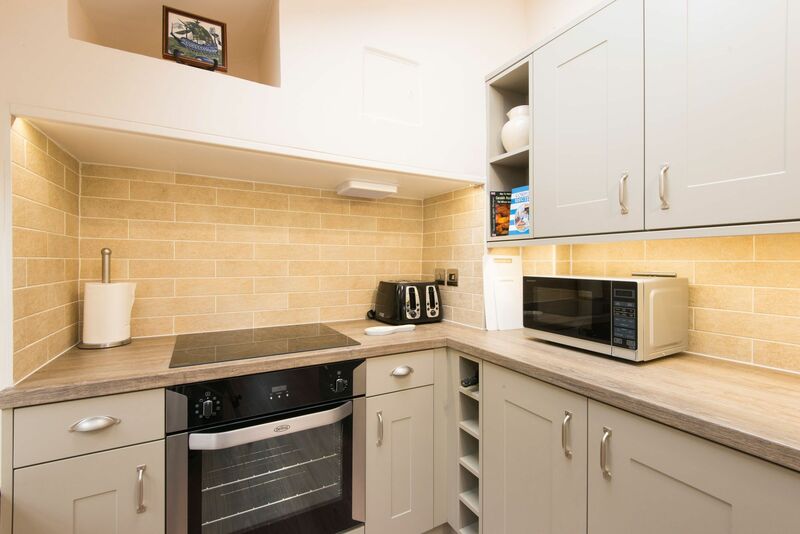 The kitchen has a range of equipment including an electric oven & hob, dishwasher, kettle, toaster, fridge & microwave. There is a separate utility area with a washing machine. There is a digital TV (newly replaced and not as pictured) and Xbox (you need to bring your own controllers), DVD player, CD & radio with Bluetooth connection. WiFi is available at the property. There is an iron and ironing board. Electricity, heating, bed linen and towels are all included but you will need to provide your own beach towels. There is a dedicated car parking space at the back of the property. Up to 2 well behaved dogs will be permitted at a small additional cost of £30 per dog / per week, although please remember that you cannot leave dogs unattended in the cottage. No smoking is allowed at the cottage. £200 pre-authorised to your credit or debit card as a security deposit is required. Portscatho and its neighbouring village of Gerrans are located on the eastern coast of the Roseland Peninsula, Cornwall, overlooking the dramatic Gerrans Bay. A truly peaceful waterside village, Portscatho is a lovely place for a holiday. There are miles of coastal and countryside footpaths to explore, particularly along St Antony's Head. Portscatho was once a busy fishing harbour, but now it has become a haven for artists due to the striking light which is particularly good in the morning sun. More than anything, Portscatho is a relaxing place. The beaches such as Porthcurnick, Towan and Porthbeor are simply idyllic and these are only minutes from the village. With a superb local butchers shop, 2 great little pubs and a well stocked local store, Portscatho and Gerrans are lovely places to spend a holiday. With stunning views across Gerrans Bay and within a few minutes walk of the villages of both Gerrans & Portscatho, the Old School House has a wonderful position. The property benefits from a modern construction yet has all the character of an older cottage including a cosy open fireplace and is a really comfortable place to stay. 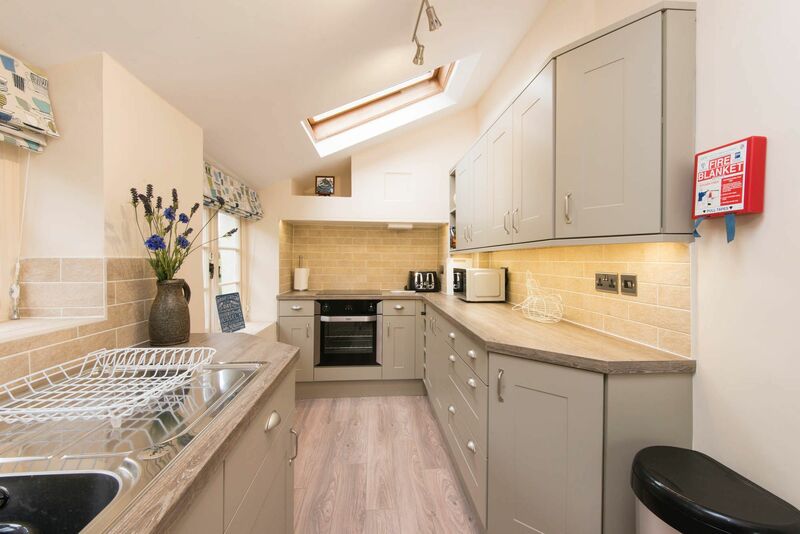 This brilliant cottage is situated close to the Gerrans village green and with an easy walk to the local pub, this is a modern property built in traditional style. The village of Portscatho with its sandy beach is just a 5 minute walk away. One of our many dog friendly cottages. Ellenglaze is a short walk from the square in the centre of Portscatho with its charming pub and pretty harbour. There is parking, fantastic sea views from most of the rooms, a welcoming open fire in the living room, a lovely mature garden also with views across the bay, an outside patio area with charcoal barbecue and it is dog friendly. No better spot for a family holiday or a romantic getaway. Seagrass is a beautifully presented ground floor apartment benefiting from an enviable location on the Lugger in Portscatho, a really short level walk from the harbour, pubs restaurants and shops. 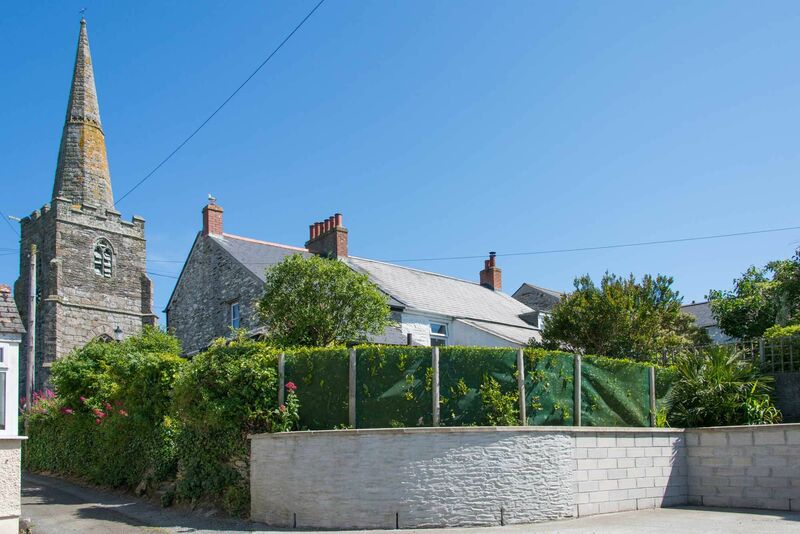 This is a superb location in the heart of Portscatho which has the added benefit of a dedicated parking space outside the property.